Over a century ago, the short stretch of land along the cliffs on Route 65 between New Brighton and Rochester was the hottest spot in Beaver County… a place called Junction Stretch. People flocked from all over the county, as well as most of Pennsylvania and neighboring states to get in on the fun and entertainment. While it now sits much quieter along the river, boasting the likes of the YMCA, Hank’s Frozen Custard, and Frontier Falls; its original inhabitants provide us with a fascinating story and look back at the early days of our region. The Beaver Valley Traction Company was looking for a way to attract new riders for their trolley that ran through the area, so in 1900 they built an amusement park and named it Junction Park. It continued to grow during its first decade and families from all over the county would ride the trolley in for a night out on the town. The park boasted two roller coasters, a toboggan slide, automatic swings, a carousel, a fun house, and many other attractions. It also had a race track with grandstands which hosted many concerts, baseball fields, a dance hall and a dinner theater. Traffic increased so much that we even had a semi-pro baseball team who called Junction Park home, the Beaver Valley Athletics. In 1909, the Ringling Brothers Circus brought 26 elephants via train and put on a show for almost 20,000 residents! They were bootleggers for all kinds of alcohol during prohibition, and even added an Olympic size public swimming pool for everyone to enjoy! It seemed like the perfect place for families… adults and children alike, to spend their time and enjoy the entertainment. Who needed Pittsburgh? We had Junction Park! Beaver County’s population continued to grow rapidly due to booming economy and the area steel mills. 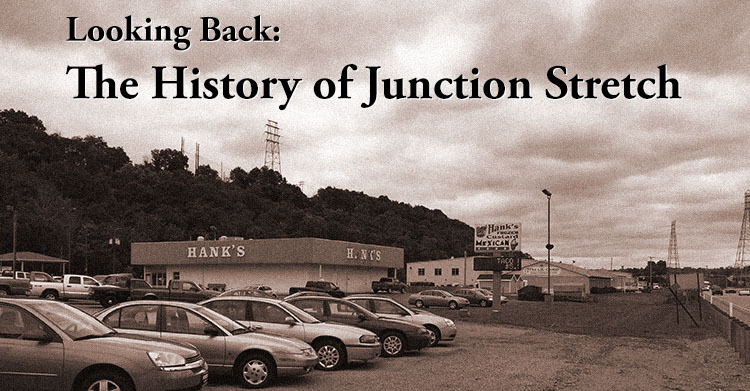 As a result, Junction Park continued to grow itself. The park was the home to the Beaver County Fair, a training camp for World War II soldiers, horse races, boxing matches… you name it, they had it! Eventually the dance pavilion was converted into a “banquet hall” meets “nightclub.” It was renamed Greystone Gardens in the ‘30’s, and was the area’s premier supper club. Residents could wine and dine and even dance to big bands right in Beaver County. Unfortunately as the years progressed, I have also never heard of a more unlucky stretch of land. Between numerous floods, the worst in 1936, literally covering the entire park, busses replacing the trolley rides, mudslides, and several fires at Greystone alone, it’s impressive that anything survived there as long as it did. After severe flooding and slowed traffic, the amusement park closed in 1941. The pool at least made it until 1964 when it was closed to make room for Fisher’s Big Wheel and Shop n’ Save. At this point they began to draw in a new type of crowd. Gone were the days of the big brass bands. Beaver County was ready for a rock and roll revolution. B.E. Taylor, The Granati Brothers, The Jaggerz, Donnie Iris, etc. Any young musicians in the area aspired to pack Morry’s to their full 400-person capacity throughout the 1970’s. Unfortunately, as the economy took a downturn in the 80’s, so did Morry’s. It had a short run as Chameleon Junction and took on more blues acts, but closed for good in the early 2000’s. The likes of Fisher’s, Shop N Save, Wagner’s and the rest of the plaza didn’t fare much better. None of them made it out of the 80’s either. While it no longer houses an amusement park, baseball fields, or a nightclub, Junction Stretch seems to have regained much of its original traction and is booming once again. Hank’s Frozen Custard and Mexican Food is by far the most recognizable staple from the “old days.” Many who remember the old amusement park and pool are able to reminisce as they devour their tacos and cones. Frontier Falls at least brings some fun back to the stretch, and it is one of the best miniature golf courses in the county. Numerous other shops line the highway as they bring business back to the area. During construction, the YMCA actually uncovered the old Junction Park swimming pool! How’s that for a fun bit of history? When I drive down Route 65 now my mind wanders and I catch myself looking over at the car dealerships and other businesses and wondering what it would have looked like when it was the hottest spot in Beaver County. If you have any fond memories of the place or even better, PICTURES, please share them with us!! I’d personally love to learn more about this historic place.  Archived in Lifestyle, Stories and tagged archive, history, junction stretch, lifestyle, throwback thursday.